I love dragonflies – and so, apparently, do Purple Martins. But not in quite the same way as me. At each marina we visited this summer we saw and heard Purple Martins, busy raising their next generation. From the early hours until almost dark, we’d hear the melodious voices of these oversized swallows – their lovely, almost metallic song that reminds me of the twang of halyards against aluminum masts (appropriate for birds that spend their summers hanging around boats). We watched the adults swooping about – mostly overhead, but on one thrilling occasion, a fast-flying Martin came right through our open wheelhouse. The birds did their best to keep the insect population at bay, and served up a steady stream of meals to their youngsters back at the nest boxes. Dragonflies were sometimes on the menu – but fortunately so were mosquitoes and other insects I feel less charitable towards. You’ll notice that the young Martin in the photo above (possibly a second-year male) has bands on both legs. That’s because, like the rest of his colony, he’s part of an intense stewardship and recovery program aimed at bringing back Purple Martins, which are a Species of Special Concern on the west coast of North America. In 1985 the population of Purple Martins in BC plummeted to an appalling low of just five breeding pairs. Loss of their natural nesting habitat (including Garry oak forests) and competition from introduced species such as starlings and House sparrows were likely the main causes. Since then, volunteers have installed about 1500 Purple Martin nest boxes around the Strait of Georgia. Many are mounted on pilings at marinas, giving boaters a first-rate opportunity to watch the birds’ antics as they come and go. Overhanging wire mesh covers protect them from predators and (as you can see in these photos) serve as “patios” for the birds to enjoy the summer air. 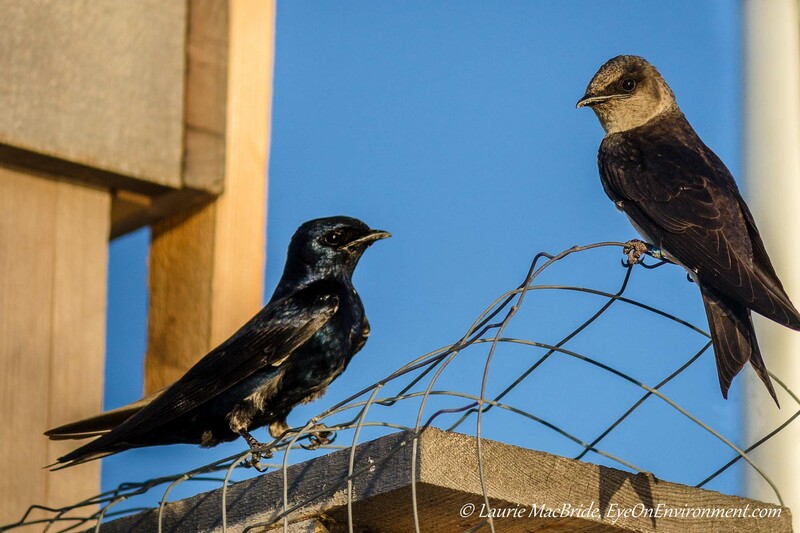 Thanks to the efforts of the volunteer program, BC’s Purple Martin population now stands at over 1000 breeding pairs. They’re not out of the woods yet, but at least these birds have a fighting chance. 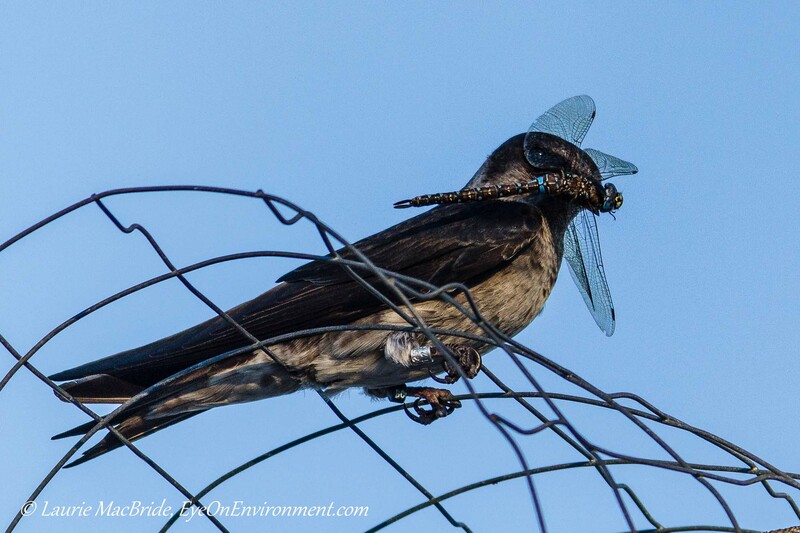 Which is more than I can say for the dragonflies when these “swallows on steroids” are around! Looks like it’s Dad’s turn. Dragonflies beware! 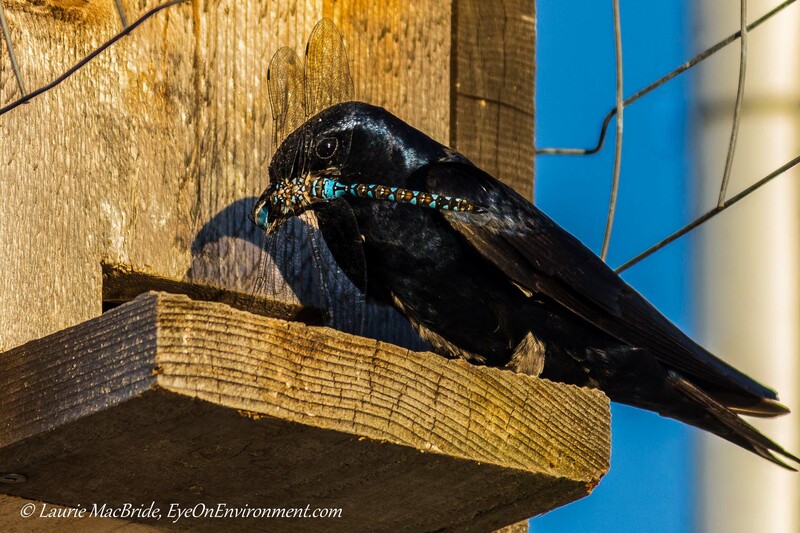 Posted by Laurie MacBride, Eye on Environment on September 8, 2015 in Animals & Wildlife, Birds, Boating, Insects & other invertebrates, South Coast & Vancouver Island and tagged animal behavior, dragonflies, feeding, habitat loss, nature, parents, photos, Purple Martin, summer, swallows. Can’t say much for their taste in food but they are beautiful birds. It’s good that they are being studied and hopefully saved from disappearing from earth. – That last shot really shows the colors of the dragonfly meal. That has to be the definition of a very bad day…Love the images; great action and the detail is superb. Thanks Charlie! And my apologies for being so slow to respond. I somehow missed your comment until now. I love your posts — in addition to the beautiful images, they are so well written and informative! And it makes me so happy to hear of stories where species are making a comeback thanks to humans rather than the other way around. It’s very heartening when this happens, isn’t it? And we need all the hope we can get these days! Thanks for the kudos, Sherry – much appreciated.